James Tarkowski believes he is a far better player for his time at Burnley already - and will improve further the more games he plays. The 24-year-old has had to wait for his chance after a £3m move from Brentford in January 2016, with Michael Keane and Ben Mee barring his way. The former Oldham Athletic youngster has only made seven starts in the league all told, but has started the last five Premier League games after injury to Mee then Keane, and Keane’s record breaking move to Everton in the summer. He has seen the way Keane evolved from a raw youngster into an England international and a move which could be worth £30m to Burnley, and uses that as inspiration: “Looking at Keano's path, the way he's done since coming to the club, I can only look at that and take positives out of it. “He's kept me out of the team, which wasn't nice, but he's really kicked on since he's come here. 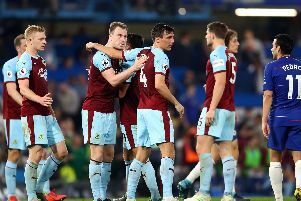 Sean Dyche was instrumental in Keane’s development, and Tarkowski feels he is in good hands as well: “I haven't played enough games to show that improvement on the pitch, but I think when I came here everyone knew I could use the ball well, but I think defensively there were always a few question marks over me. “Being a defender, that's the most important part of your game. It's something which the gaffer spoke to me quite a lot about and worked on on the pitch, and even in the analysis rooms, sitting me down and going through a few things. Dyche was a centre back himself, and likes his defenders to defend first and foremost: “I think so. That's our priority, we're there to stop goals. Tarkowski didn't give £30m Belgium striker Michy Batshuayi a kick at Chelsea on the opening day, but replacement Alvaro Morata, a £70m summer signing from Real Madrid opened his eyes a little to the quality at this level: “First half I thought we dealt with them quite easy to be honest. We knew what he (Batshuayi) was going to bring to the pitch and me and Ben suppressed that. “Morata, I think it was £70m they paid for him, so you expect him to cause a few problems. “Personally I need to be switched on a bit more. I'm disappointed, especially with the first goal, but over the 90 minutes I was quite pleased. “It was good movement. That's what you pay money for, to score goals. “From my side I'll always nitpick at little things and there's bits I still need to work on. But on the back of shutting out Christian Benteke at Crystal Palace in April in Burnley's only away win of last season, he is full of confidence: “From the games I've played, end of last season and last week, I've been pleased in the most, but there's still work to be done for myself. Tarkowski’s size and aerial presence will be an asset against tomorrow's opponents West Brom at Turf Moor, but he warned the Baggies have more in their armoury: “I'm sure I'll be heading a few this weekend! “They are good at what they do, West Brom. They finished top 10 last season so they're good at what they do. “They pick up results, picked another one up last week against Bournemouth. “We know what to expect but we've got to impose ourselves on them. I think we'll have quite a bit of the ball this week so we've got to really use it well and make chances. “We've not necessarily been working on just set pieces, it's their style of play, sit in and hit us on the counter.